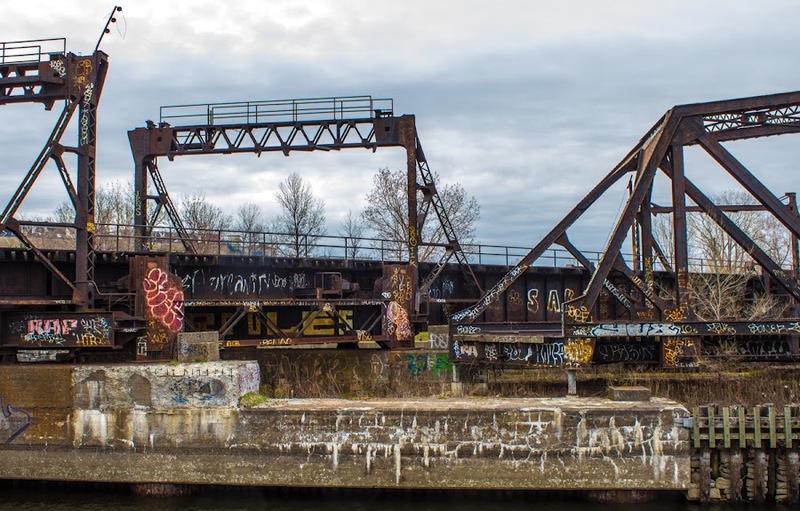 This is the other rail bridge over the Lachine Canal, right next to the section I posted yesterday. It looks to be in the same state of (dis)repair as the first. I think these tracks lead into Montréal's Central Station downtown, so this would be an actively used bridge. The western flank of the bridge. That's part of yesterday's bridge on the right. The graffiti artists/taggers have had a good time here as well. I wonder if there will come a time when this type of "art" goes out of fashion and people stop doing it. What will they do instead? A close up of the graffiti. Notice the water bottle tucked inside the structure? Our weather continues to be chilly and wet. No big rains or flooding danger, just light rain, drizzle actually, and high temperatures that flirt with 70ºF. I'm already looking ahead for a window in which to cut the grass again. It's loving this weather and growing at a steady clip (pun intended). The eastern flank of the bridge. Meanwhile, in the vineyard, the grape vines have set flower. Barring any really bad weather, grapes should form soon. Looks like a lot, too, so many of them will end up cut away, discarded, to ensure the proper yield. 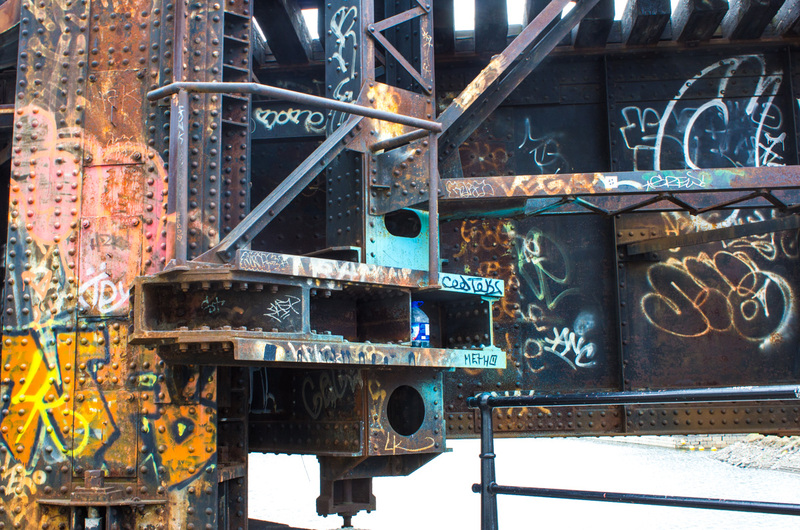 There's something about old railroad bridges. They are practical, no nonsense, form-follows-function structures. And they can be beautiful. This one, over the Lachine Canal in Montréal, is covered with graffiti. Still, it's nice. If you look real close, you can see a dummy perched inside the center structure. 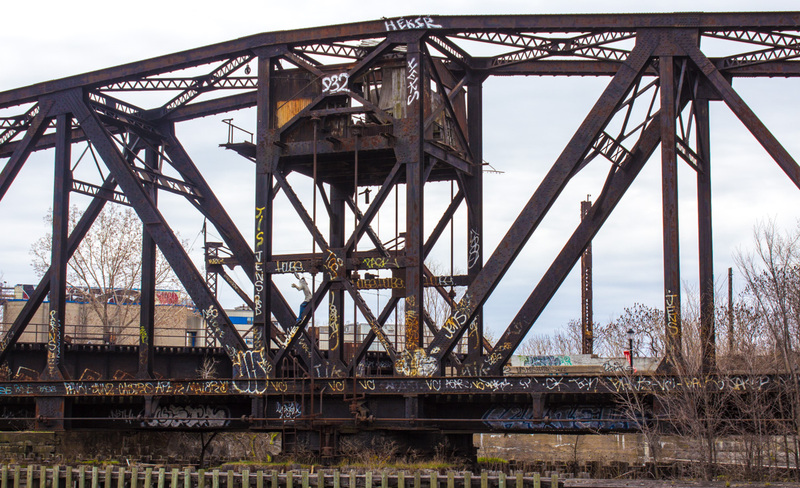 This is one of two railroad bridges over the canal that I saw on my walk. I think it was a pivoting bridge, able to be turned out of the way of passing canal traffic. 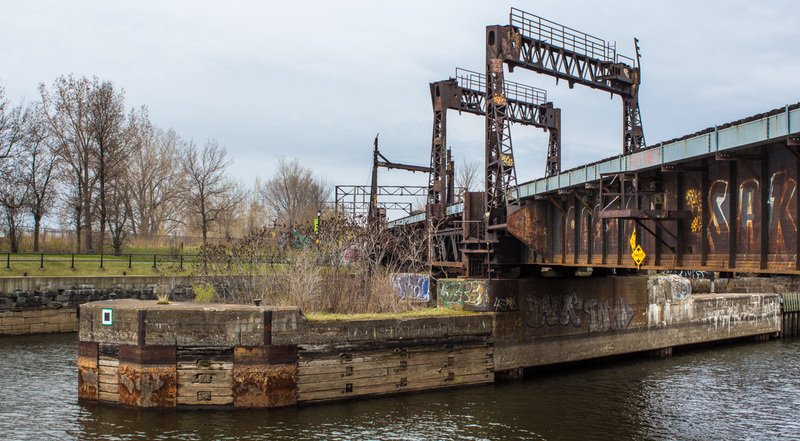 There are no longer any tracks on either side of the canal for it to connect to, and it's turned in the "open" position, I'm guessing permanently. I'll post some photos of the other bridge tomorrow. The longer I stare at this image, the more patterns I see. Horizontally. Vertically. Even the graffiti has a rhythm to it. I wonder what this building would look like with the windows unshuttered. Look at the texture in that stone wall just above the waterline. 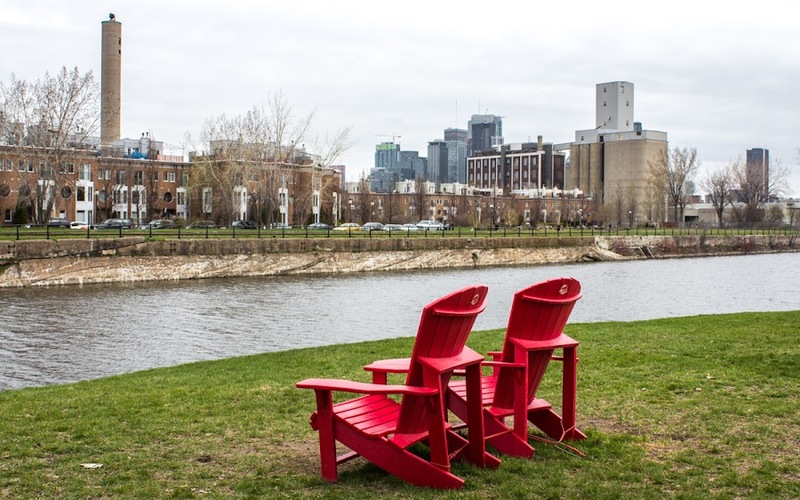 Are you getting tired of this part of Montréal? I realize that these are not typical "tourist" images. I still have a way to go, so bear with me. I've shown this group of high-rises before, but I thought that this perspective was interesting. The buildings on the right and left are new residential mid-rises on the canal. The tall buildings behind are on the western edge of downtown. 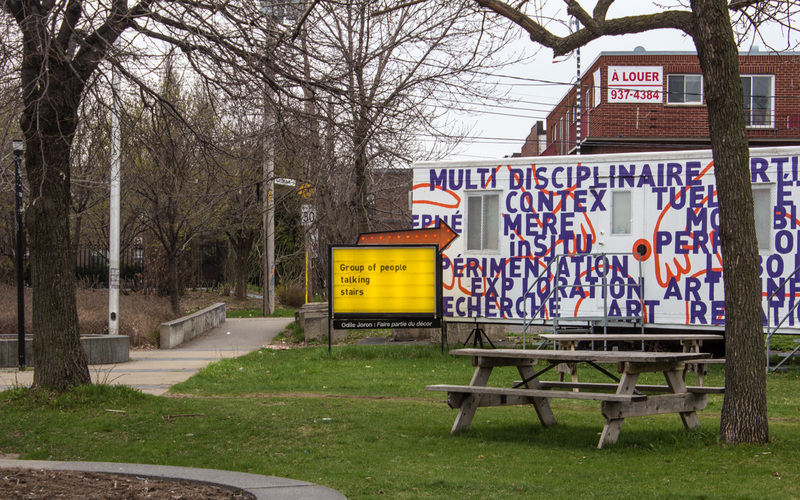 I was approaching the neighborhood called Griffintown at this point in my walk. Lots of glass, steel, and concrete. The Bell Center (bottom middle) is the home of the Montréal Canadiens hockey team. When Ken and I were in Montréal in 2012, we had dinner at a trendy restaurant in Griffintown called "Le Hangar." The restaurant is gone now, but I remember it being located in an old one-story building, surrounded by boarded up warehouses and vacant lots. The neighborhood was already changing, but none of these new mid- and high-rise residential buildings were there then. I don't think there's any doubt that this is a construction zone, but just in case, there's a sign to let you know. Downtown Montréal seen from the canal corridor. On Saturday, I moved our empty greenhouse tent from out by the vegetable garden to a spot up against the house. Now it's on a more level spot and is easier to get to. And it's not empty any more. We're keeping our basil plants inside because they like it hot. And I planted some catnip seeds just for fun. 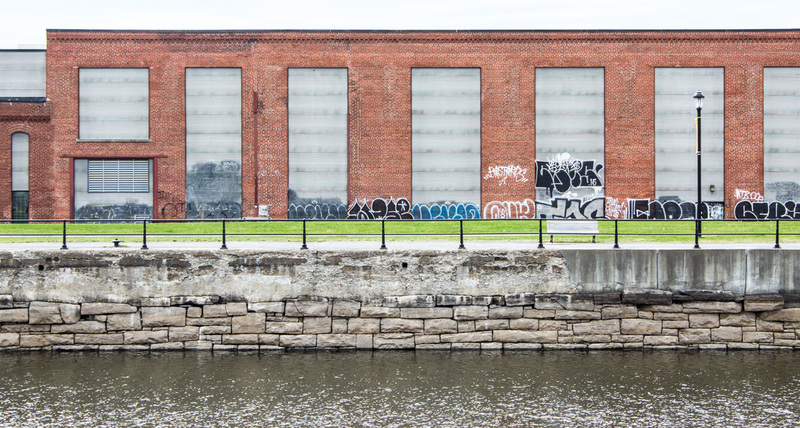 Here are two more shots from the vicinity of the Saint Gabriel Lock on Montréal's Lachine Canal. There are no stories to tell, just views. I like the first one as an example of blending old and new construction in the neighborhood. The second is a long look down toward the river and the port. That's the direction I was heading. 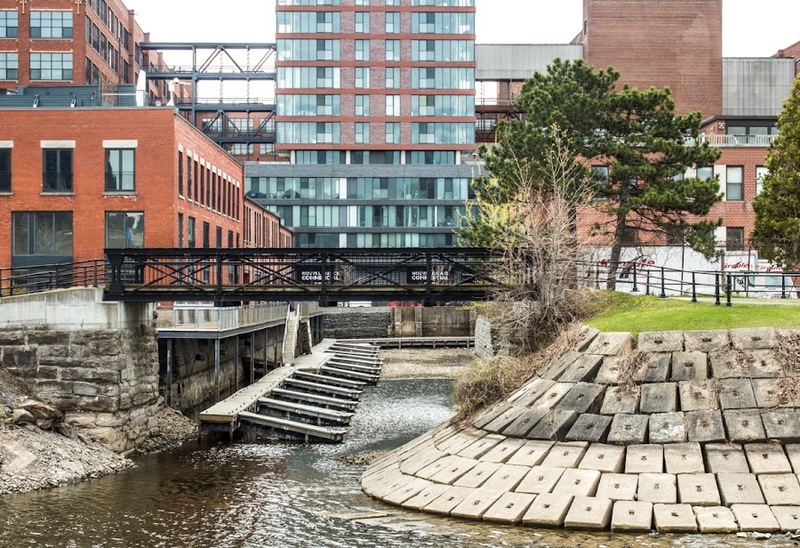 The old industrial look is incorporated into a new development. I still have a long walk ahead! About a third of the way into my walk, I crossed back over the canal at the site of the Saint Gabriel Lock. The lock and its surroundings seem to have been restored to accommodate pedestrians and bicycles, and there were rest rooms in the control house, but the building was closed up when I was there. 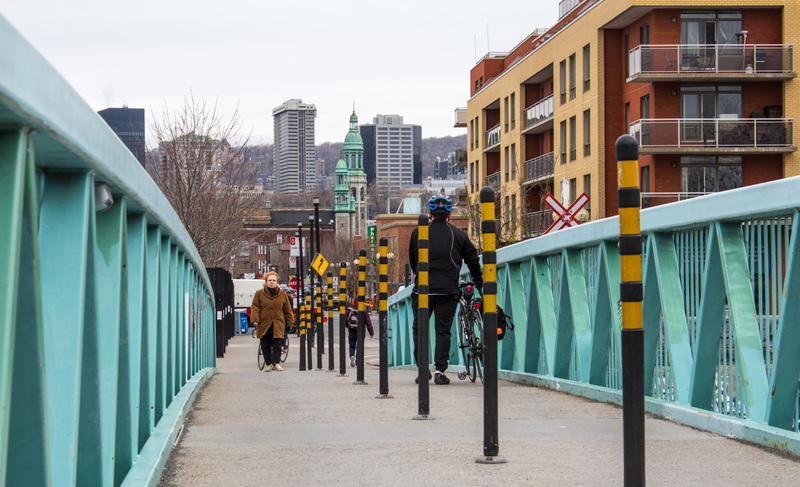 Pedestrians, cyclists, and motorists moved back and forth across the Des Seigneurs bridge. The bridge carries the rue des Seigneurs across the canal. The lock is one of five locks that still operate along the canal's length. At least, I assume they are in working order and probably operate to allow recreational boats to pass through the canal. I took more than a few photos at this spot; here are some of them. 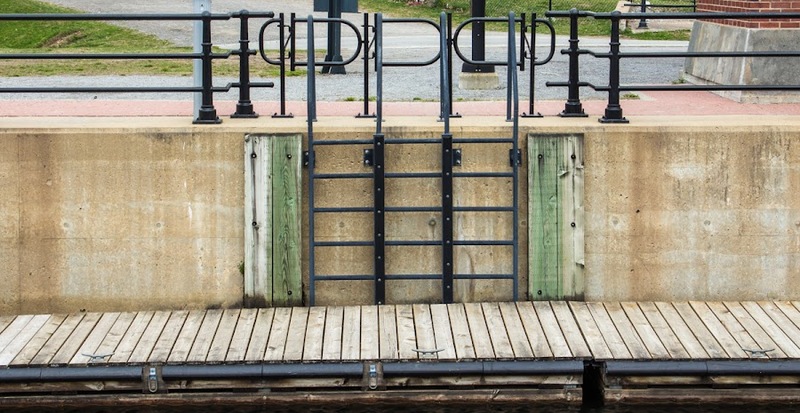 A dock that rises and falls with the water level. 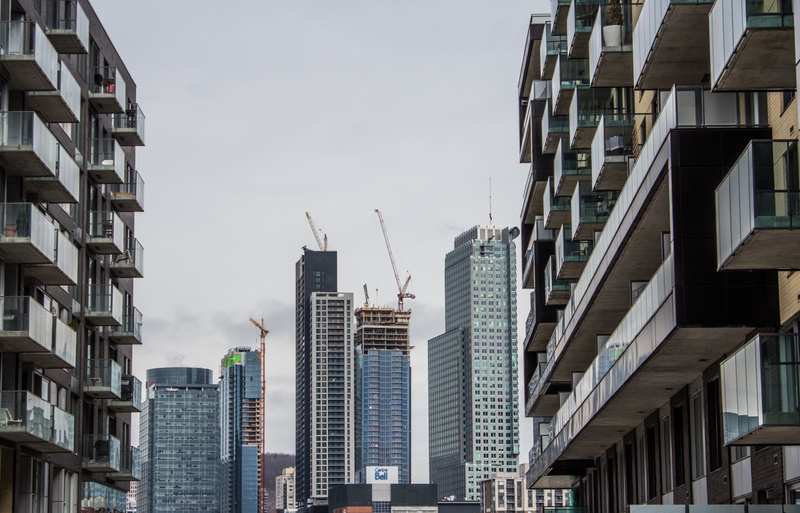 Downtown Montréal is not too far away at this point. 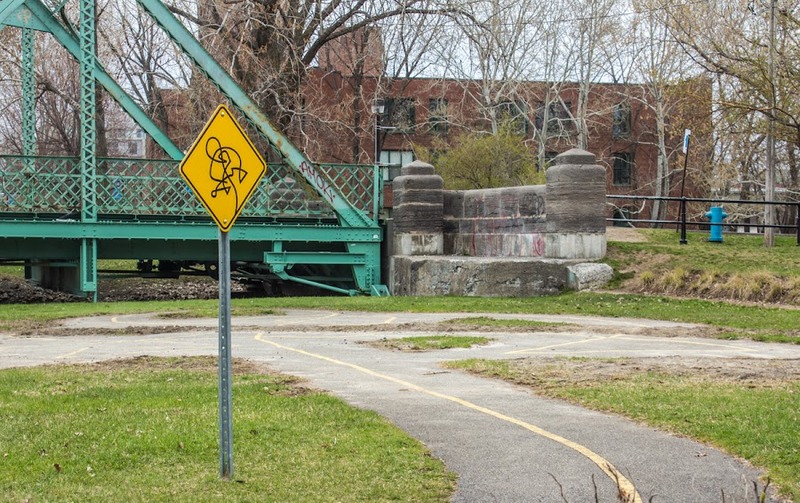 Another view of the Des Seigneurs bridge. Looking down-canal (toward the north-east). The lock doors were closed on this end. 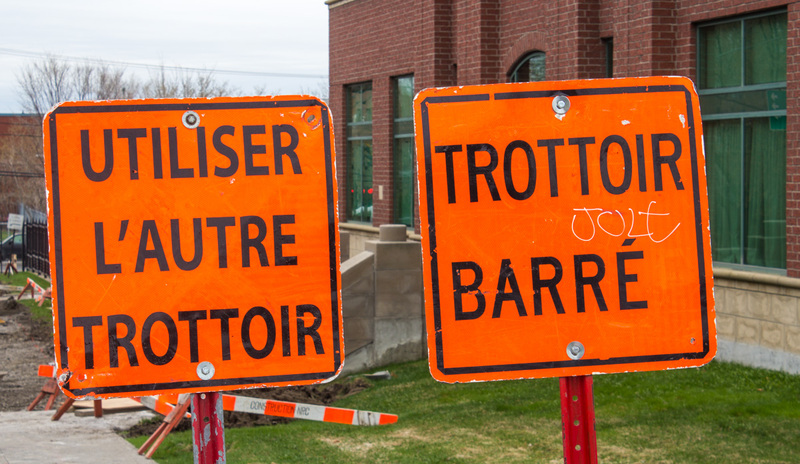 These Montréal construction signs certainly caught my eye. The street was under construction (reconstruction) and the sidewalk had to be closed, too. Sign on the right: "Sidewalk closed." Sign on the left: "Use the other sidewalk." 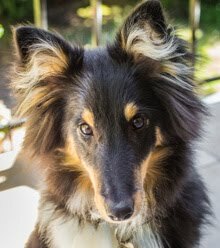 We had a very hot (for us) day on Wednesday. I measured 30ºC (about 86ºF) on the deck at the height of the afternoon. The strange thing, well, there are two strange things. First, we went from feeling "wintry" on Tuesday to full-bore summer on Wednesday. And second, it was more humid than I remember it being most of the time we've lived here. Very unusual. I did manage to get a good portion of the grass cut and should be able to finish it up today. I know the veggie garden is liking this. A transitional neighborhood is just that, a neighborhood in transition. It's changing. So there is old and new. Here is some of the old. I couldn't tell if this building was occupied or not, but the parking lot behind it seemed to be unused. 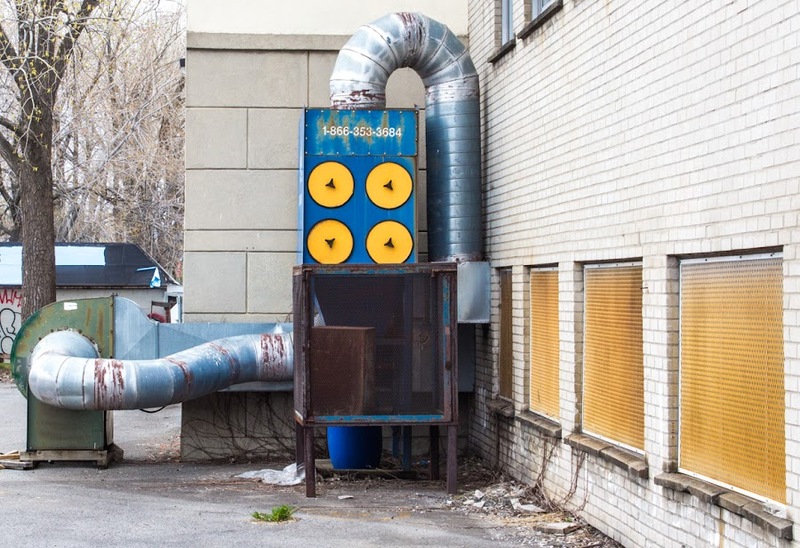 I wondered if this might be part of the HVAC system, but that would probably have been on the roof. Whatever it is, I thought it looked cool. It looks strangely new and strangely old at the same time. Then there was this old chimney, but I couldn't tell what it had been attached to. The graffiti artists had a good time, nonetheless. You either like it or you hate it. I don't know how I feel about it, except that it makes a nice photo. And then, across the canal, I saw these two tractor things. The day was so gray that their color kind of caught my eye. Brightly colored tractors on a drab day. But for what? I saw these Adirondack chairs along the Lachine Canal in Montréal. They weren't the only ones; more (in pairs) were installed at other locations along the pedestrian and bike paths. I'm not sure if they're art or just places for people to sit. Or both. They were all red. Notice the newer high-rise buildings on the edge of downtown in the background. I noticed a lot of construction under way in the city. At first I thought this was a work of graffiti. Then I wondered why a blank sign would be planted at this spot (or any). Finally I got closer and saw what was on the ground. If you look carefully, you can see that the pavement markings on the ground match the tangled "spaghetti" on the sign. It's art! There was not a good spot to get at better picture of both sign and pavement, but you can see the idea. 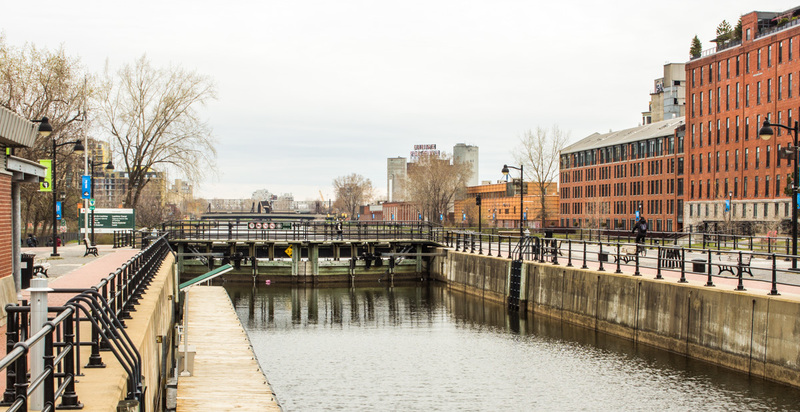 After I crossed the canal, I started to follow the path toward downtown and the old Port of Montréal. I walked along a footpath that paralleled the bicycle path. The next bridge I encountered was at rue Charlevoix. The Rue Charlevoix bridge looking down the canal from the pedestrian bridge at Ave. Atwater toward the Old Port on the Saint Lawrence River. The path twisted down and under the bridge, and the canal narrowed so that half of the bridge was over dry land. I'm not sure why it's like that. The bike path dips under the bridge and back up again on the other side. These bridges are made of steel, and they look very northeastern (in other words, familiar) to me. A far cry from the old medieval and renaissance stone bridges of France. Modern, utilitarian, and still beautiful. 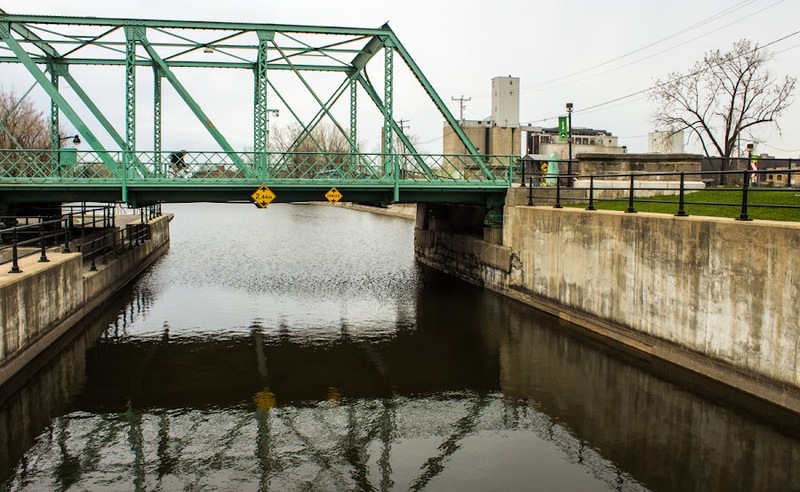 I crossed over the Lachine Canal on this pedestrian and bicycle bridge. You can tell how chilly it was by the way people were dressed. I was impressed by the number of cyclists there were during my entire morning walk. It was rush hour, so I'm assuming that most people were headed to work or school. 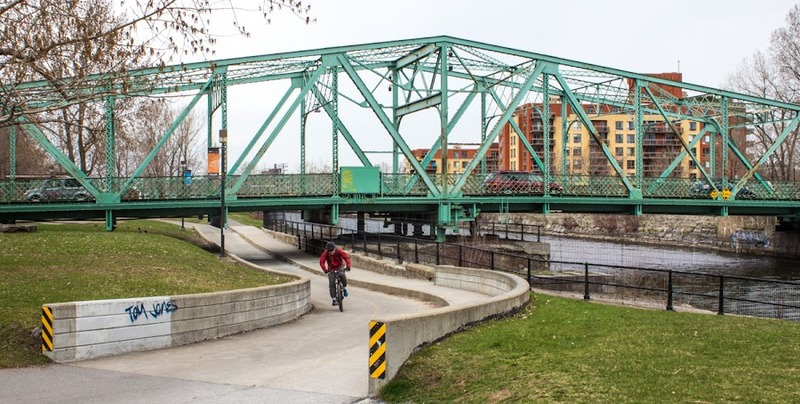 Bike paths run along each side of the canal and connect to routes into the surrounding neighborhoods. The green-domed towers are the Paroisse St.-Irénée church up by the Lionel-Groulx métro station where I started my walk. I rode the métro from the hotel to my starting point (the green box with the white arrow inside), then walked along the red route back to the hotel (the red box with the white dot inside). 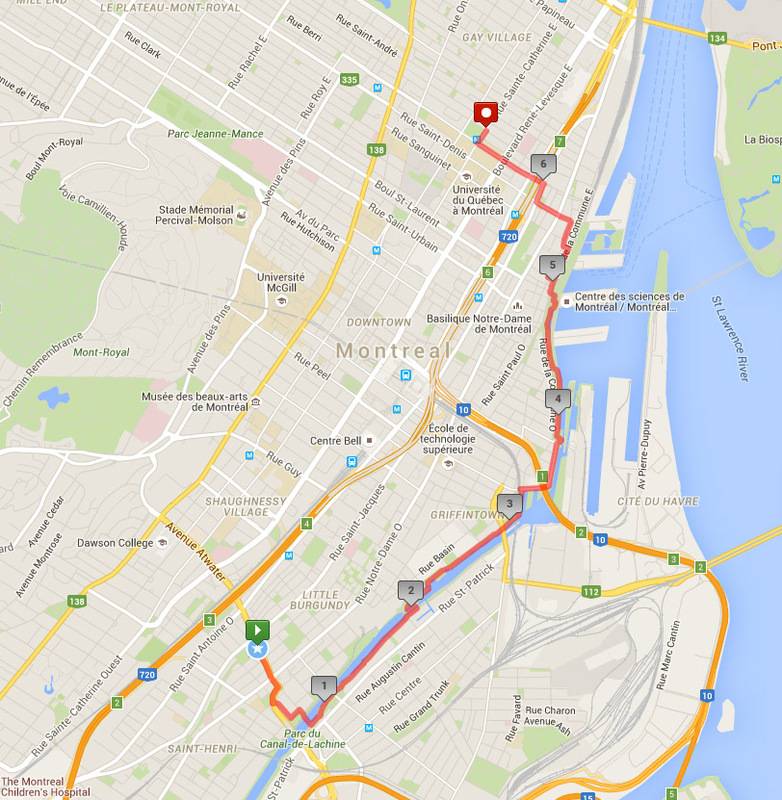 The total route was about 6.5 kilometers (about 4 miles); the numbers in the gray boxes are the kilometer markers. As I left the Atwater Market and headed down the Avenue Atwater toward the canal, I saw this interesting street sign. I had no idea who this guy is/was/could be. So, upon my return to France, I did some extensive quick and dirty internet research and learned that Mr. Rockhead owned and operated a very popular jazz club in this part of Montréal from 1928 through the fifties. He was born in 1899 in Jamaica. And he was black. A relatively new apartment building at the intersection of Rufus-Rockhead and Atwater. A black club owner in those days was extremely unusual. In fact, some believe he was the first in Montréal, and perhaps even Canada. Mr. Rockhead used his savings from his job as a railway porter to open the club. Most of the famous jazz names of the day played there, people like Billie Holliday, Ella Fitzgerald, Nina Simone, Cab Calloway, Duke Ellington, and Louis Armstrong. Now I know how this street got its name. 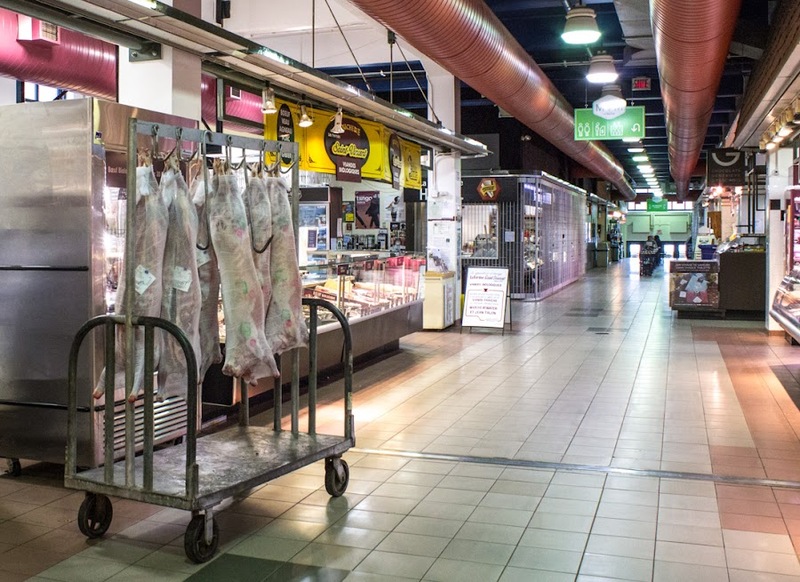 One good thing about arriving at the market hall very early on a chilly Wednesday morning was that there were no crowds of shoppers in my photos. I took a few shots inside and then outside as vendors were setting up their shops for the business day. A section of the main hall. Looking the other way. I assume those are whole pigs ready to be cut up for sale. Uh, never assume. You know the rest. Prepared foods including pork, chicken, lamb, beef, and veal. Looks tasty! 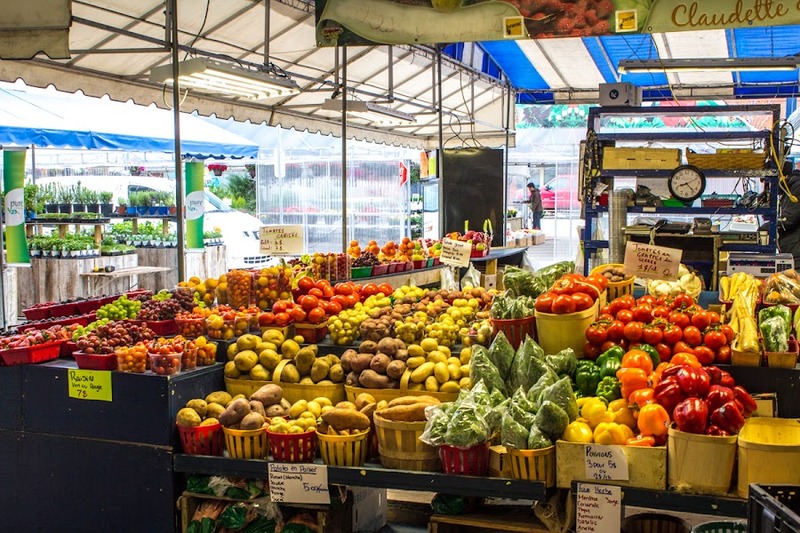 One of the outside stalls filled with fruits and vegetables. When Ken and I were in Montréal four years ago, we stumbled upon the Marché Jean Talon; I just saw it on a map and we decided to check it out. It was a beautiful Saturday morning and the market was crammed with shoppers. On this year's trip, I wanted to see another of Montreal's markets: the Marché Atwater, located in Little Burgundy along the Lachine Canal. 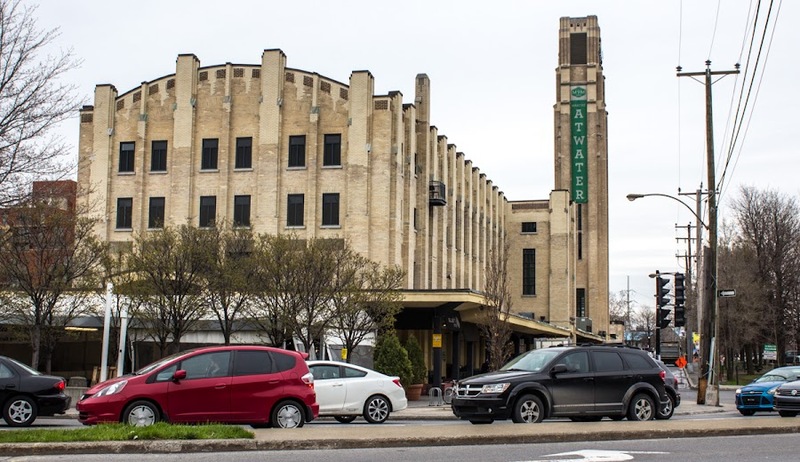 A view of the art deco Atwater market building in the morning rush hour. But this time the weather was not beautiful, in fact it was downright chilly and windy, and I went on a Wednesday morning, very early. The atmosphere was not at all the same. The vendors, mostly indoors, were just setting up. I didn't see very many shoppers, just a couple of people having coffee. Still, I wandered in and around, imagining what it might be like on a sunny summer weekend. A view of the market from across the Lachine Canal. I was out of my hotel room very early the next morning. Jet lag. 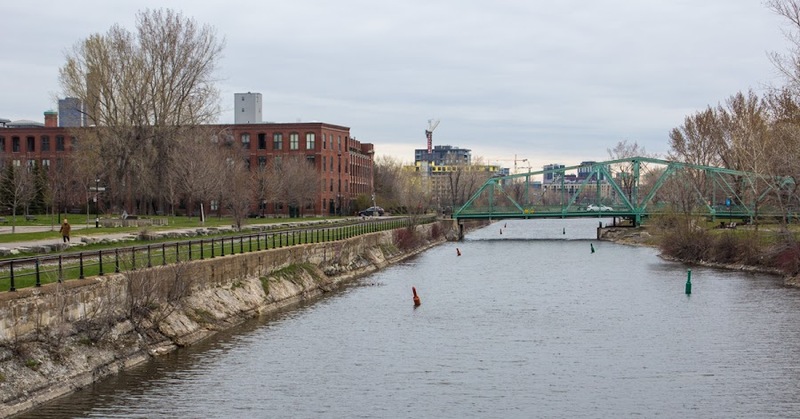 I wanted to visit the Atwater Market and see the area around Little Burgundy and, more specifically, the Lachine Canal neighborhood of Montréal. It turned out that I spent most of my time on the canal and missed most of Little Burgundy. Next time. I used my métro pass to get to Atwater from across town. On the way from the subway station to the market, I came across this. Group of people, talking, stairs. It's part of some kind of city-wide social art installation, I think. I saw something about it, somewhere, but didn't focus on it at all. And I have no idea what it means. But there it was, so here it is. Oh, and there's an apartment for rent in the building just behind. My Air Canada flight was very comfortable. The interior of the plane seemed to be new. The staff was friendly and the flight was very smooth. We landed a little late due to a strong headwind, but getting through immigration and customs was a breeze. Soon I had my bags and was ready to venture out. The view from my hotel room, looking away from downtown. The tower of the Olympic Stadium is visible on the upper right. I went to an ATM to get some Canadian cash, then found a kiosk where I could by a three-day transit pass for $18 (Canadian). The pass was good for the airport bus into the city, then good for unlimited trips on the subway. Such a deal. I got to the hotel and checked in. My room was on the 20th floor, but it looked away from downtown. Oh well. I took a shower then went out for a little walk. 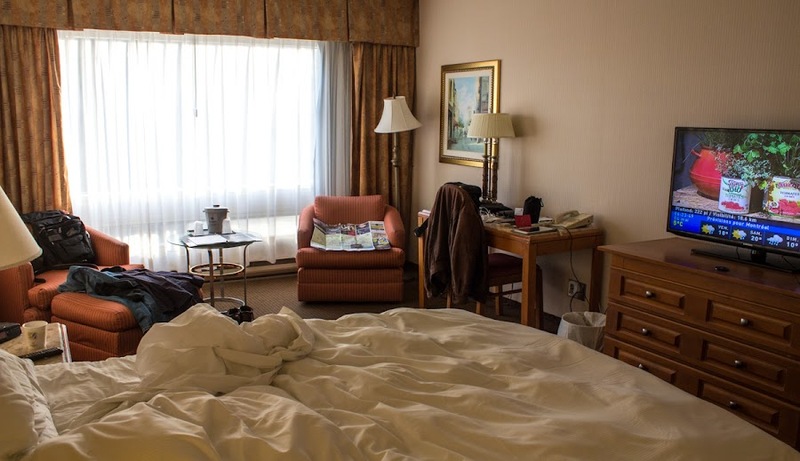 My room the next morning, watching the weather channel on television and drinking coffee made with the in-room coffee maker. At 7:30pm, I met friends N. (aka The Beaver) and her husband Y. for dinner. They took me to a Portuguese restaurant up in the Plateau neighborhood of Montréal. 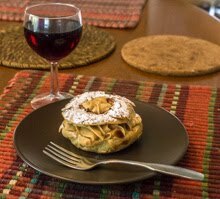 Everything was delicious, and we had a good time catching up. Our appetizer was a mixed plate of fried calamari, marinated octopus, and grilled chorizo. My main course was a house steak (served with a fried egg), Y. had a rare steak served on a searing stone, and N. had a large fillet of cabillaud (cod), if I remember correctly. We washed it all down with a house red, the provenance of which I can't remember. After I got my fill of Les Halles, I ventured down into the Châtelet-Les Halles métro station and rode over to Odéon on the Left Bank. There are two cafés there that I know and I wanted to sit down and have a drink. I chose Le Danton because it was on the shady side of the street and ordered a glass of chardonnay. The waiter brought it with a little plate of potato chips. I watched people scurry by in all directions, crossing streets, getting on and off of buses, and entering and exiting the métro station like ants going into and out of their nest in the ground. I finished my drink and ordered another. It came with a second little plate of potato chips. I devoured them. Now pleasantly light-headed, I walked back to my hotel, dumped the backpack and camera in my room, and headed back out for dinner. I took this photo of my Air Canada plane (a Boeing 777) at the gate in Paris with my ASUS tablet and then emailed it to Ken. I planned to walk through the old neighborhood where I spent a few months in 1981 and eat dinner at a pizzeria that we liked back then. The Vesuvio is still there and going strong (apparently they've opened a branch on the Champs-Elysées; wow). I got a table under the awning on the sidewalk and had a pizza, salad, and half-bottle of Valpolicella. 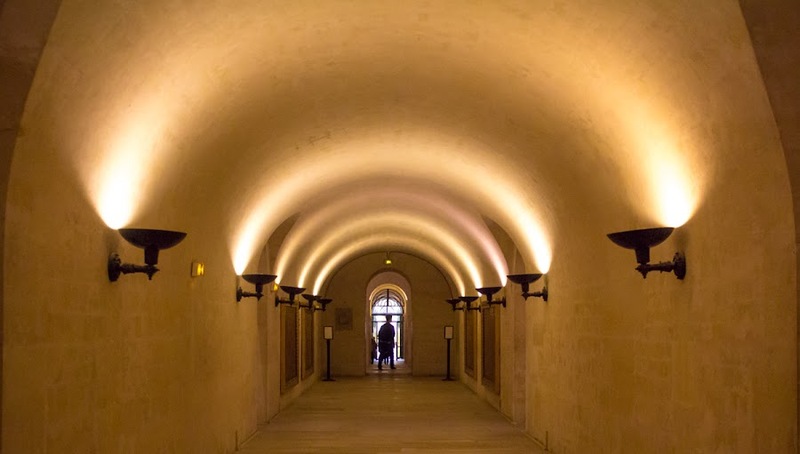 Then I wanted to walk it all off, so I wandered toward the river, crossed through the Louvre courtyard, then headed toward the Marais, where I stopped for a cognac (at Les Philosophes on the rue Vielle du Temple) before going back to my Left Bank hotel. I have no photos of any of that because I had left the camera in my room. Sometimes it's better to just enjoy the experience instead of trying to document the experience. The next morning I had breakfast and checked out of the hotel. I lugged my luggage to the RER and rode the train up to the airport, where I did all the check-in and security stuff. With some time to kill before my 1:00pm flight, I sat in a little café and ate a salad. I may have had a half-bottle of rosé, too. We were soon boarded and took off, on time, for our seven-hour flight to Montréal. 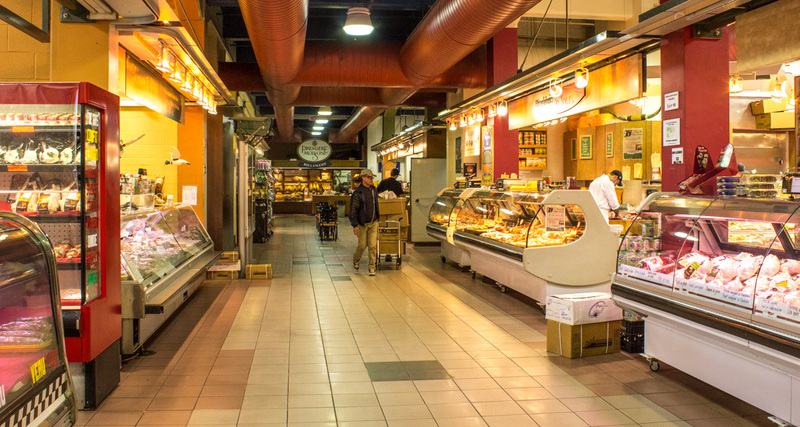 The neighborhood at Les Halles is undergoing another transformation. 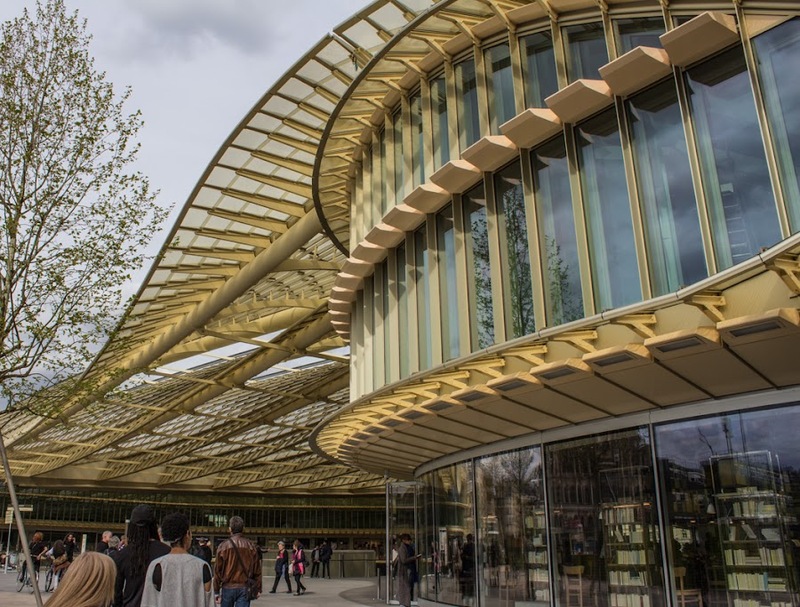 Since the historic Paris market was moved from the center of the city to the suburbs in the late 1960s, the neighborhood has seen a couple of transformations. For more than a decade after the move, the city center was a huge construction site. 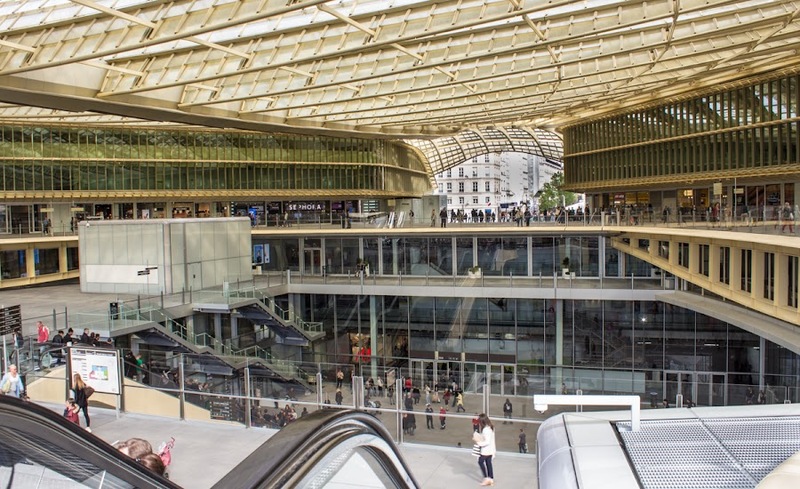 I remember it being called le trou des Halles (I'm tempted to translate that as "the Halles hole") referring to the massive excavation needed to build new transit transfer stations, underground automobile bypasses, and the underground shopping mall called Le Forum des Halles. Looking west, across the Forum, toward the dome of the Bourse de Commerce. The church of St.-Eustache is on the right. Those yellow/gray/green construction buildings and fences will eventually go away. 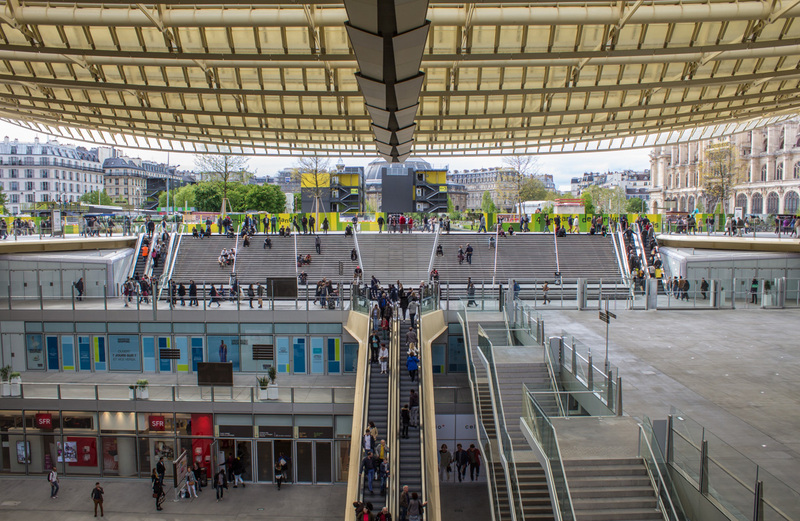 When I arrived in Paris for the first time in 1981, the neighborhood was still walled off with construction going on everywhere, even though the train stations were operating and the Forum was open for business. Back then, navigating the place on foot was a challenge, to say the least. Looks like an eye and eyebrow. During the 1980s, after the construction was completed around the Forum, more underground amenities (including a public swimming pool) were added and the expansive street-level gardens were completed to fill in the space between the Forum and the Bourse de Commerce to the west. The gardens were very nice and became a gathering place for Parisians and tourists alike. The neighborhood's transformation was finally complete. Looking east, across the Forum shopping center, the view out toward the Beaubourg quarter is restored. Except that it wasn't. In the early 2000s, the city decided that something wasn't working and called for a complete redevelopment of the quarter. I have to admit that the 1970s stylized architecture was not aging well, and its layout didn't do a very good job of accommodating pedestrians or giving them a feeling for the space as a whole and how it connected, or not, to the surrounding neighborhoods. 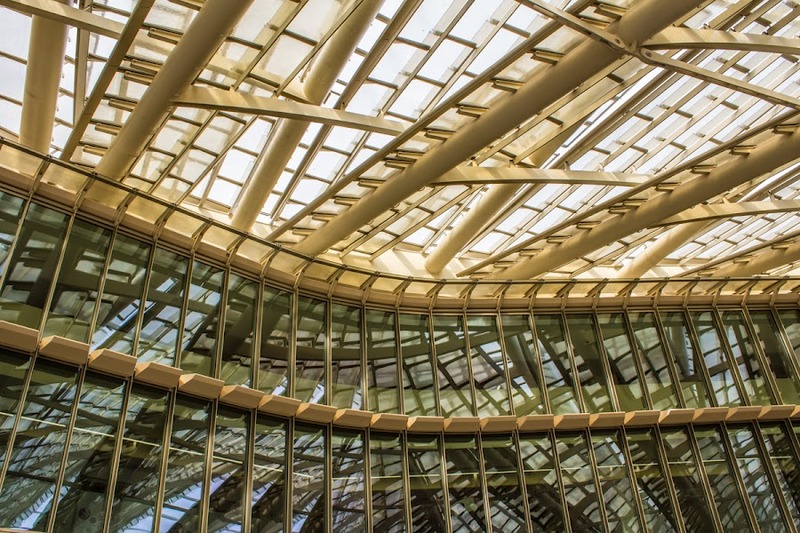 The steel and glass structure of the canopy meets that of the surrounding building. A competition was held, a winner selected, and demolition and reconstruction began in 2010. This year (2016), the first phase of the project was dedicated. 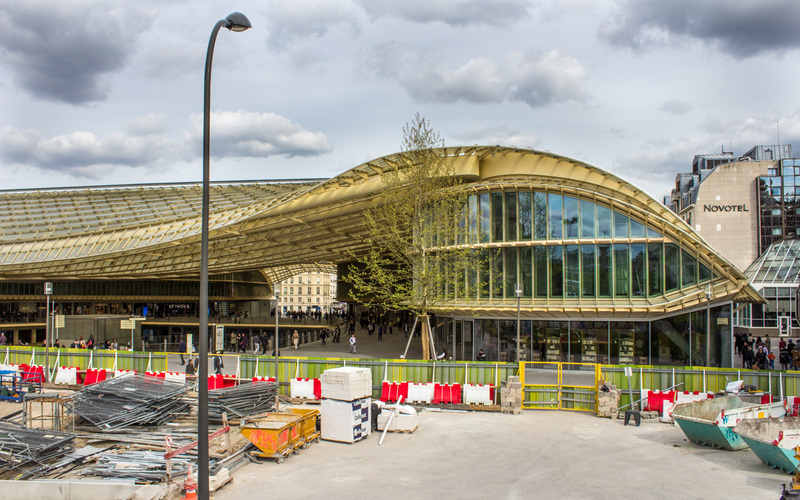 The renovated access to the large underground transit center (three suburban lines and five métro lines converge there) was opened, the Forum renovation is nearing completion, and the huge ground-level building with its signature canopy over the shopping center was opened. There's still a lot of construction going on. This is from a viewing platform over what will become part of the renovated gardens. 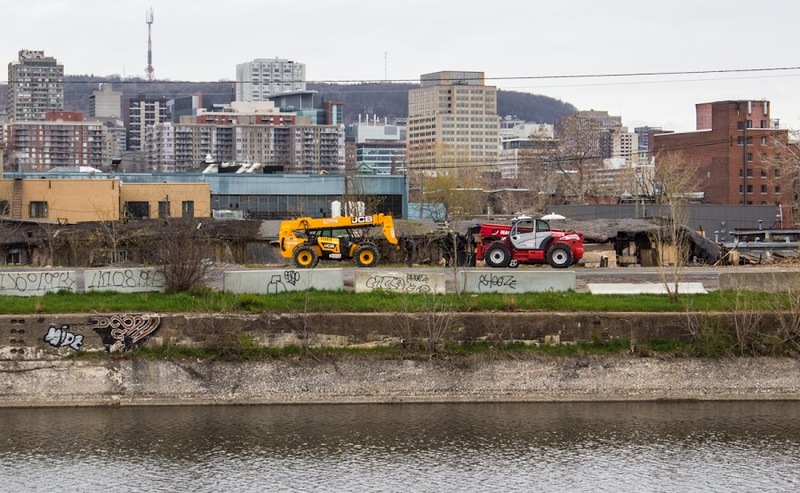 The construction continues as the gardens are renovated and connections to the city are reestablished around the site's perimeter. I took some photos around and inside the canopy. There is still evidence of construction and final touches that need to be made, but I think the pedestrian experience has been greatly improved. I found myself able to read the space better, with visual perspectives that helped me orient myself with the surrounding neighborhood; many visual barriers seem to have been successfully eliminated. Looking west again, you can almost feel the weight of the canopy over your head. It will be interesting to see it all done, whenever that happens, and to see how people start to use the space. I'd also like to see it at night. I like the canopy concept in general, but at times it did feel a little oppressive as it dips downward in the center, almost as if it is trying to push pedestrians down into the darkness of the Forum rather than trying to guide them back up into the light of the city (why do I feel like I'm back in architecture school?). Sorry to include so many photos in one post, but I think I need to get this trip underway. 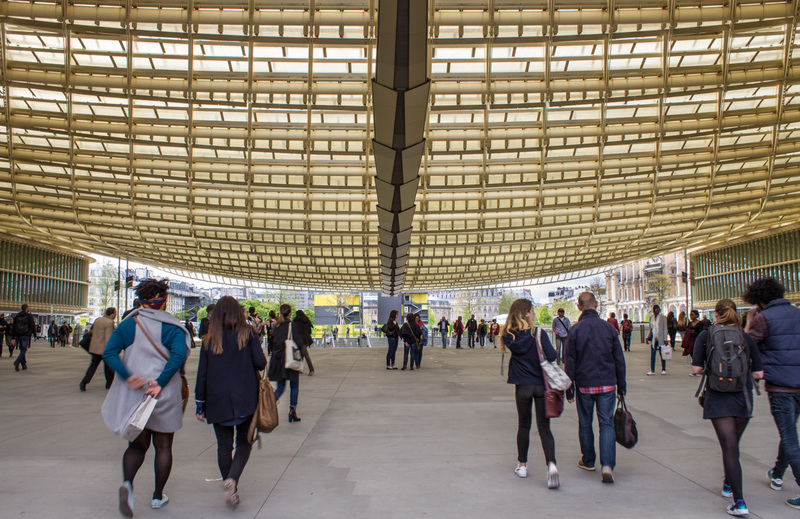 The posts from the Panthéon to this one at Les Halles were from just the first few hours of my trip. The next day I flew from Paris to Montréal. 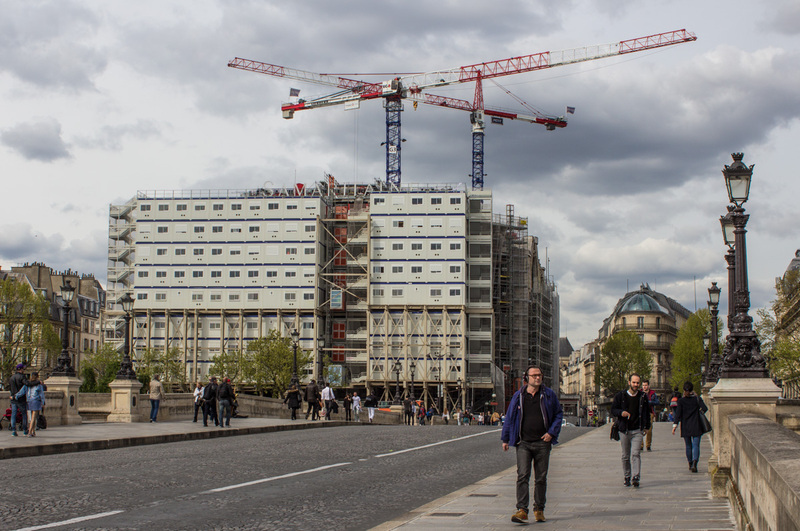 If you know Paris, then you might recognize La Samaritaine behind those stacked temporary construction offices. The iconic Parisian department store closed its doors in 2005 after the building was declared unsafe. 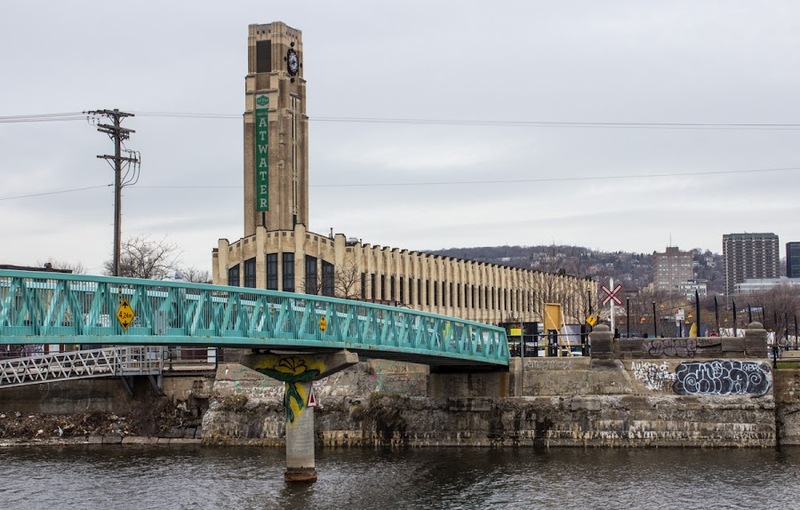 A project to renovate and redevelop the site has been on-again/off-again ever since, with controversies related to historic preservation of facades and other elements of the buildings. I think, however, from what I've read, that agreements have been reached and construction is again proceeding. I left the Place Dauphine and continued across the Pont Neuf to the Right Bank and La Samaritaine. The department store is gone; it was having serious financial difficulties prior to the buildings' closures. The new project will include apartments, offices, and a luxury hotel, but only a minor retail component. The site is as prime a piece of real estate as any in Paris, and the art deco buildings are as recognizable to Parisians as Notre Dame or the Eiffel Tower. I'm glad that they're not being destroyed. Back in 1982, Ken and I and other members of our group would frequent the department store's café on the roof. For the price of a cup of coffee, you could spend hours up there taking in the views from what is essentially the center of Paris. It was a traditional café with waiters and seating outside in the open, replaced some years later with a more modern self-service kind of place. It was not the same. I wonder if the new project will include a roof-top café? La Samaritaine's advertising slogan was "On trouve tout à la Samaritaine" (You can find everything at the Samaritaine) for many decades, so I used it in the past tense for my title. The Place Dauphine is a triangular park framed by apartment buildings on the river sides and the Palais de Justice to the east. 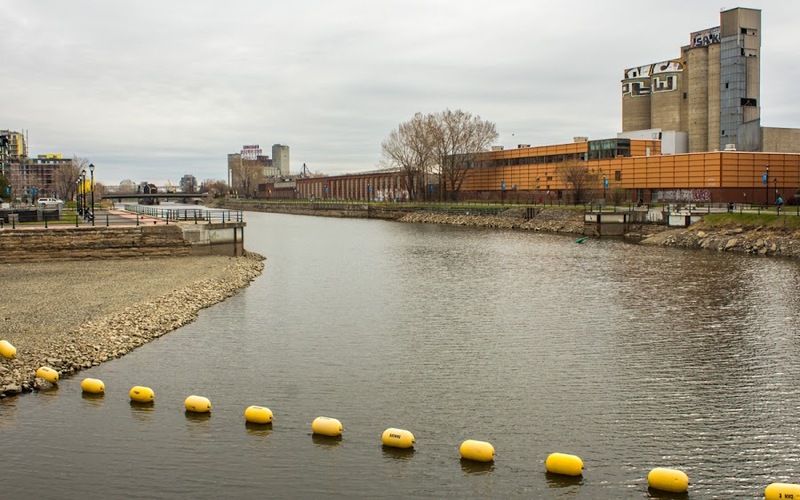 It's built at the western end of the Ile de la Cité where the island comes to a point. Leafy trees shade the park in spring and summer; it's a favorite spot for the game of boules. Looking north across the Place Dauphine. I was looking through the fence that separates the park from the adjacent street. I don't know if those people are the players or not, but it looks like they've just taken a break from their game. The oldest bridge over the Seine in the city of Paris is the Pont Neuf (the New Bridge). I've frequently photographed it from the other side, with the point of the island clearly visible and the towers of Notre Dame behind. This perspective, with the Louvre in the background, makes a nice change. The view down river, toward the west, and a good chunk of the Louvre museum. To my right, outside the frame of the photo, is the vast Palais de Justice, which includes the gothic Sainte-Chapelle and the historic Conciergerie prison. 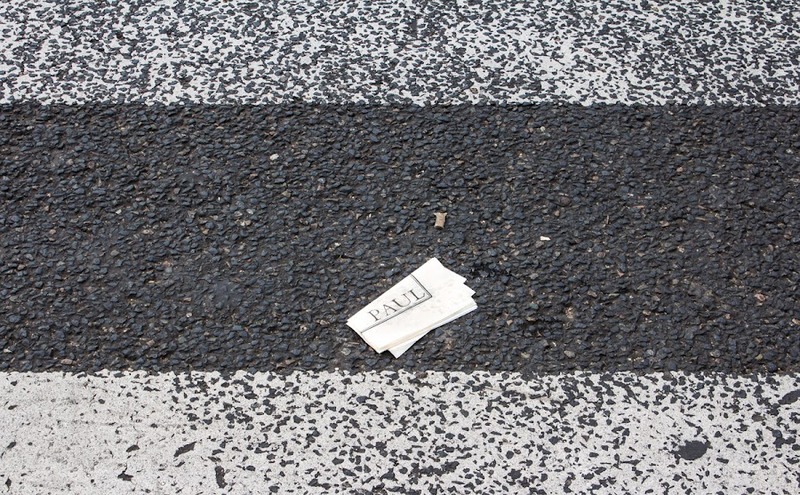 On my way across the Ile de la Cité, I saw these discarded napkins in a crosswalk. I risked life and limb to stop and take the picture. I'm not sure what was more dangerous, oncoming traffic or crossing pedestrians. But, obviously, I survived. Paul is a chain of bakeries/restaurants in France and around the world. I think the only time I've been to one was at an autoroute rest stop some years ago. But I see them around, especially in Paris. 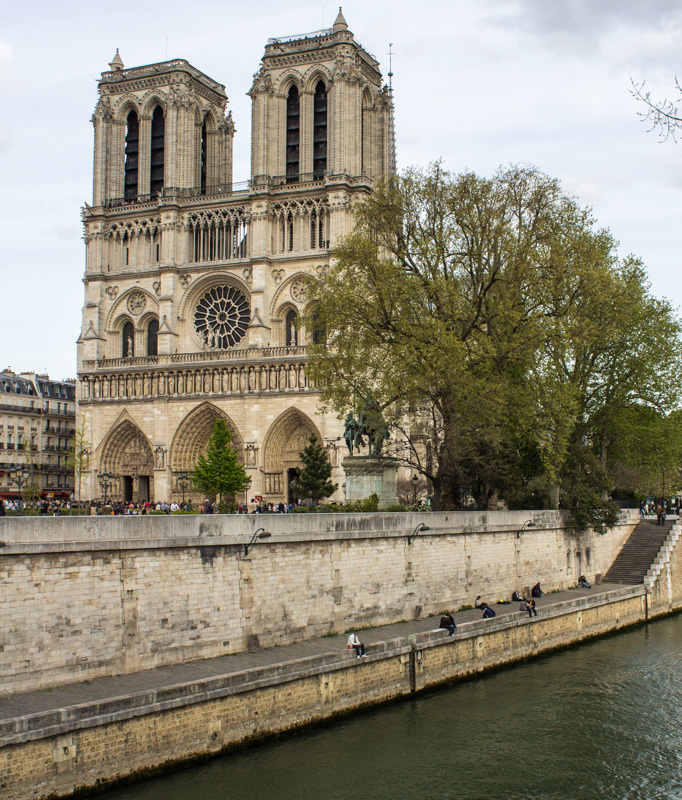 So, after my Star Wars adventure and getting some cash from the ATM, I made my way down toward the river and crossed the Petit Pont not far from the cathedral of Notre Dame de Paris. I took a few photos of the church, of course. I think I posted this one as a brief Image of the Week when I got back from my trip. I thought I should put the bigger version on the blog for posterity. 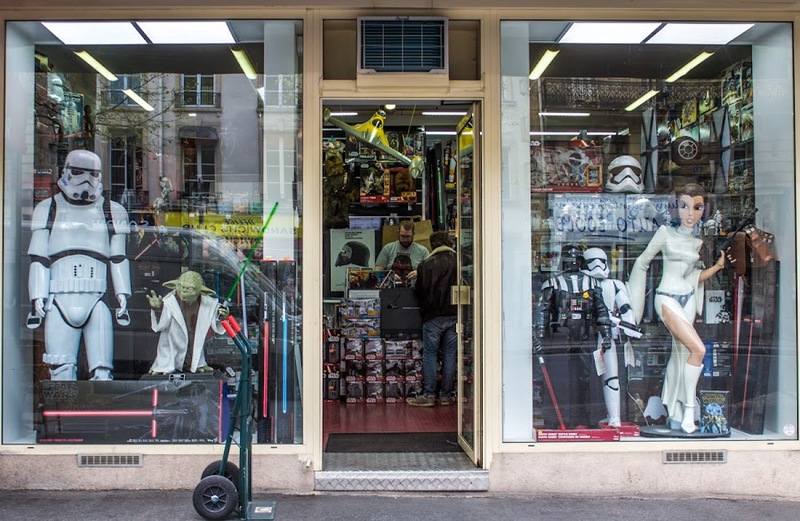 So that's where storm troopers get their uniforms! I saw this store very close to my bank's branch office in the Latin Quarter. I couldn't resist a photo. Although, that really doesn't look like how I remember Princess Leia. Darth Vader looks shorter in real life. Yoda, yoda, yoda. 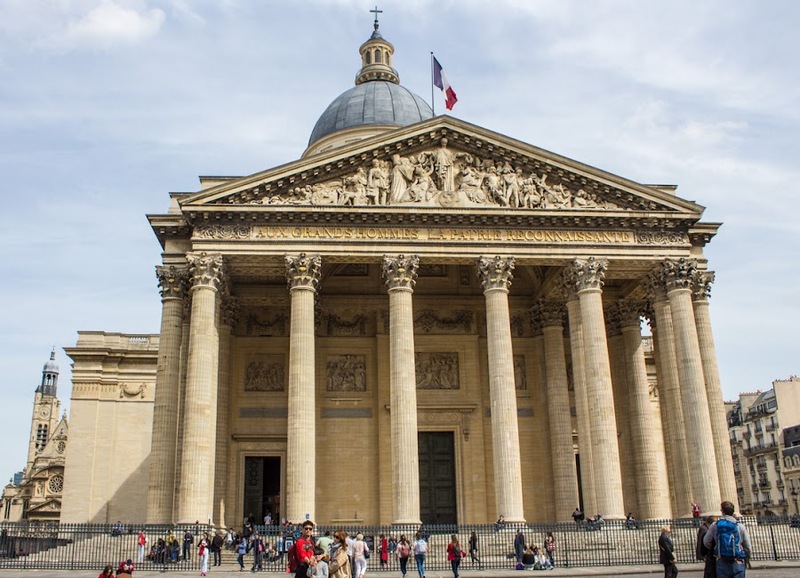 Here's the front of the Panthéon as I was leaving, seen from the top of the rue Sufflot (named for the building's architect). I headed down the rue St.-Jacques toward the river. I needed to stop at an ATM and I knew that my bank has a branch on the Boulevard St.-Germain, not far from where I was. Appropriately monumental. You can see the église St.-Etienne-du-Mont peeking out from behind on the left. Since the afternoon was warm and pleasant, I thought I'd walk over to les Halles via Cité and the Pont Neuf. That way I could walk past Notre Dame and through the Place Dauphine along the way. After the tour of the dome, I wandered down into the Panthéon's crypt, where most of the monuments to the glorious dead are kept. That's not something that interests me much, so I made quick work of it. Besides, the restrooms were very close by and I needed to, well, you know. I left the Panthéon and headed over to the Right Bank, where I was hoping to see what they've been doing to Les Halles. All of that to come; stay tuned.